This delicious salted caramel cheesecake with a shortbread cookie crust is really good! Behold a dessert of the gods. 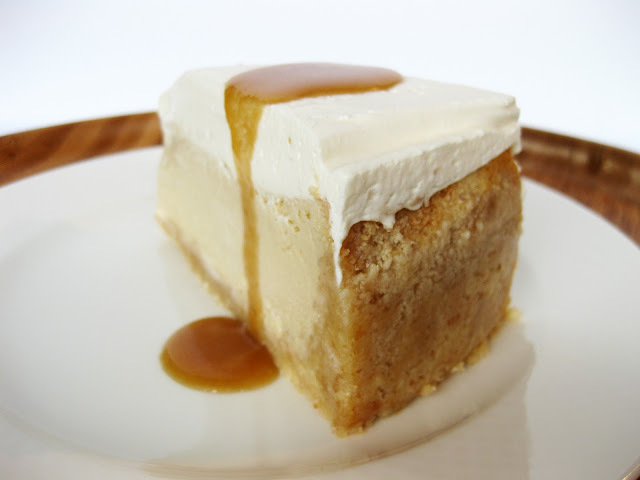 The vanilla, shortbread and caramel flavors are wonderful together, their sweetness offset by a tangy sour cream topping and DELIGHTFUL sprinkling of salt. Set it on the table and witness a disappearing act that requires no slight of hand. What else is great? It's a cheesecake with ricotta *and* cream cheese. This means it has a fluffier texture than cheesecakes that use only cream cheese and a smoother texture than those that use only ricotta. Plus, if your cheesecakes often crack on the top despite loving care and precautions, the sweetened sour cream layer covers up everything beautifully. A great trick for your next cheesecake malfunction. What's not great? The original recipe uses the metric system, so the conversion results in unusual measurements (like 1.4 cups). I've made careful conversions below for those in the US. This salted caramel cheesecake recipe makes a dessert that's rich without being too dense. Process the shortbread cookies and almond meal in a food processor until coarsely chopped, then add the butter and process a bit more to combine. Press the mixture into a greased 8-inch or 9-inch springform pan lined with parchment paper. Refrigerate for 1 hour. Preheat the oven to 160°C (325°F). Place the ricotta and cream cheese in an electric mixer bowl and beat for 5–6 minutes or until smooth. Add the sugar and beat for 3–4 minutes. Add the eggs one at a time, beating well after each addition. Add the golden syrup, salt and 1 teaspoon of vanilla extract. Combine well, and pour into the shortbread cookie crust. Place the cake pan in a baking dish. Pour enough boiling water into the dish to come halfway up the sides of the cake pan. Bake for 1 hour 30 minutes or until firm to the touch. Remove the vanilla cheesecake from the baking dish and let it cool. Refrigerate for about 3 hours in the cake pan. Place the cream, sour cream, powdered sugar and remaining teaspoon of vanilla in an electric mixer bowl and beat until soft peaks form. Top the vanilla cheesecake with the cream, and either serve immediately or refrigerate overnight. To make the caramel sauce: Place the cream, butter and sugar in a saucepan over low heat and stir until the sugar is dissolved. Increase heat to high, bring to a boil, and cook for 5–7 minutes or until it has thickened. Set aside to cool. 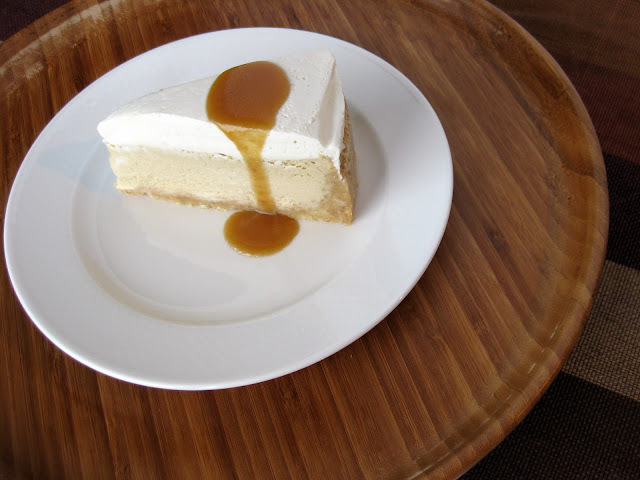 To serve: Slice the vanilla cheesecake, drizzle with caramel sauce, and sprinkle with salt. This sounds amazing. After I find some "golden syrup," I'm making it!!! In what universe is Shortbread (WHEAT) paleo??? None! Not all recipes on the site are paleo! You can easily find the paleo recipes labeled in the "Paleo" section under "Recipes" or via the "paleo" tag in the tag cloud, etc.